Fill 5-quart Dutch oven two-thirds full of water; heat to boiling. Add linguine, bell pepper and peas; boil 2 to 3 minutes or until tender. Drain and return to Dutch oven. 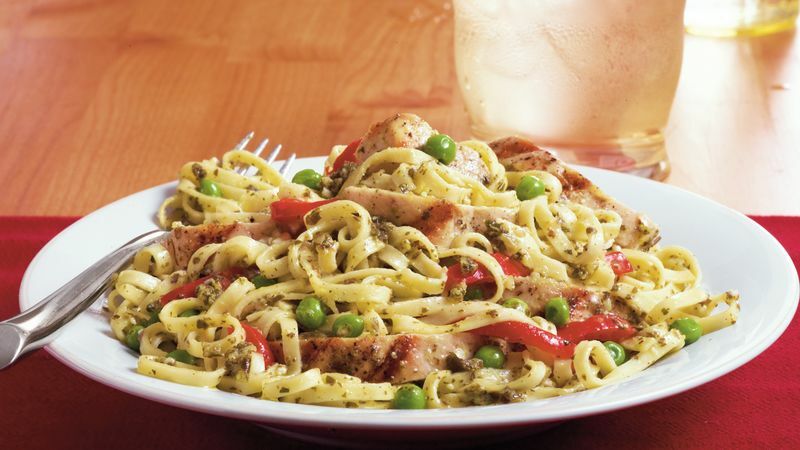 Stir pesto, chicken and cheese into linguine mixture; cook over medium heat until thoroughly heated. Use 2 cups cut-up deli rotisserie chicken or leftover grilled chicken for the purchased grilled chicken breast strips. Gorgonzola is a mild form of blue cheese. If your family doesn’t like Gorgonzola, substitute feta cheese.